Week 3 Response: God’s Word as Sacred Sound and the Concept of Prophethood. The Prophet Muhammad being the “Seal of the Prophets,” the long line of Prophets stretching back to Adam, and the role that all Prophet’s played in spreading God’s word on earth were all major themes of the third week’s lecture. “Say: we believe in God and what has been revealed to us and what was revealed to Abraham, Ismail, Isaac, Jacob and the tribes, and in what was given to Moses, Jesus and the prophets from their Lord. We make no distinction between one and another among them and to Him (God) do we submit (literally, we are submitters “muslims”)” Quran 8:34. As well as discussing the various gifts of the various Prophets we also discussed another concept that is central to Islam, that of The Prophet Muhammad being the “Seal of The Prophets,” and the Qur’an as being a perfect manifestation of God’s message, and one that all the previous scriptures were leading up to. Therefore, in this drawing, I’ve tried to incorporate all these elements by representing them through something we are all very familiar with: a lock and a chain. 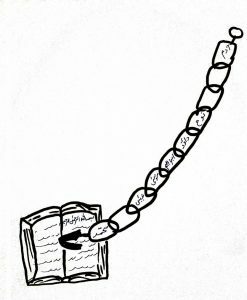 The underlying theme behind this drawing is that the Prophet’s, starting from Adam and ending with Muhammad, were all like a chain and lead up to the lock, which in this case is God’s final message: the Qur’an. I’ve tried to convey the theme of the interconnectedness of all the Prophets, their eventual goal of perfecting God’s message, a manifestation of which is the Quran, and the Prophet Muhammad being the last Prophet, and therefore the seal of the Prophet. I’ve purposely left some gaps while writing down the names of the Prophet’s inside this chain. As the total number of Prophet’s sent down by God exceeds over one hundred thousand, I’ve only written down the names of some that were mentioned during lecture, and these gaps represent all those that I have not mentioned.